In 1975, George Faison became the first African American to win a Tony Award for Best Choreography for The Wiz, a musical known for its strong use of dance and music to tell its own story based on The Wizard of Oz. This past August, in honor of The Wiz’s 40th anniversary, Faison’s musical came back to the stage during New York City’s SummerStage Festival. 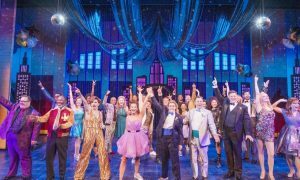 Not only did Faison recreate some of his original choreography on a batch of young, up-and-coming dancers but also some of the show’s original cast members came back to perform their roles for this special anniversary production. 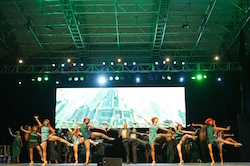 This anniversary performance, The Wiz: A Celebration in Dance and Music, reached enthusiastic, over-capacity crowds at Central Park and Harlem’s Marcus Garvey Park for three evenings, August 12-14. 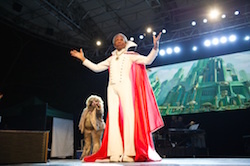 ‘The Wiz’ at SummerStage. Photo by Michael Seto, City Park Foundation. In order to include some of the original moments of choreography, Faison turned to original cast members Dee Dee Bridgewater, who played Glinda, the Good Witch of the South; André De Shields, the Wiz; Ebony Jo-Ann, who played Addaperle in the Broadway revival; Inaya Day, who was the original understudy to the role of Dorothy; and Garry Q. Lewis, the Scarecrow in the show’s Broadway tour. In addition, Timothy Graphenreed, the show’s original music and dance arranger, joined the team again. Original cast member Dee Dee Bridgewater says that to perform the 40th anniversary celebration of The Wiz and to reconnect with her fellow performers was “a beautiful stroll down memory lane”. The hardest challenge for Faison during this reconstruction process? For Faison, this anniversary celebration of The Wiz was not only a chance to do and see the show again. It was also an opportunity to share it with audiences who were familiar with the musical and also those for whom it was new. 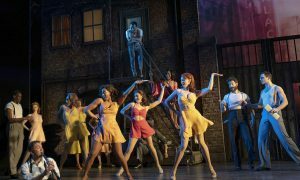 For the younger dancers involved in the production, to work with Broadway veterans on a historic show seems to have been quite the rewarding experience. Faison notes that all dancers should have such an opportunity. Photo (top): The cast of ‘The Wiz’ at SummerStage. Photo by Michael Seto, City Parks Foundation.